About Us - Schroeder Material, Inc. In 1920, Emil Schroeder started Home Ice with his three brothers. They had four routes and served Chicago’s south side with ice and coal. They used to cut the ice from Lake Michigan and store it in a warehouse, using saw dust as insulation. With the invention of the refrigerator and natural gas heating, ice and coal were fading away. 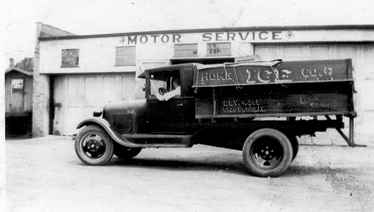 As time went on the company was forced to change direction and Home Ice slowly started into the moving business. 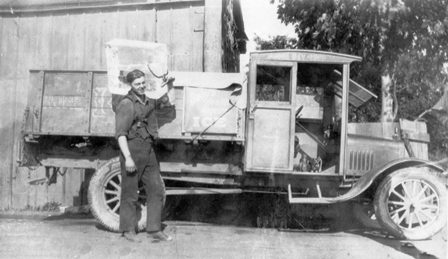 Schroeder Movers was moving both residential and commercial clients. By 1960 they changed gears again. 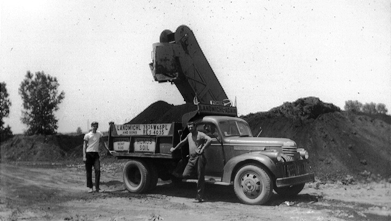 Schroeder Material was heavily involved in the excavation business. Through the 70’s and 80’s we slowly transformed into a wholesale and retail outlet for building, drainage and landscape materials. By 1983 Emil had passed and William and Richard Sr. had taken over the family business. At this point they decided to concentrate on landscape and drainage supply. They have expanded greatly. Today, Schroeder Material is one of the largest landscape suppliers on Chicago’s southwest side. We carry the top brands in the industry, including Belgard and Techo-Bloc. In 2012 we added our garden center. It spans more than two acres and you’ll find a wide and unique variety of trees and shrubs. We also carry a large selection of statuary, and fairy garden supplies and plants. Schroeder Material’s employees are horticulturalists. We have the expertise to help you with your fruits, vegetables, ornamentals, and non-food crops to maximize their health and growth. Schroeder Material services both contractors and the public. We deliver and rent the tools and equipment needed to get the job done right.